safe meat will define the market in the future. referenced to many other studies [2,6-9]. lated, which, for a long time, has been a stagnant niche. 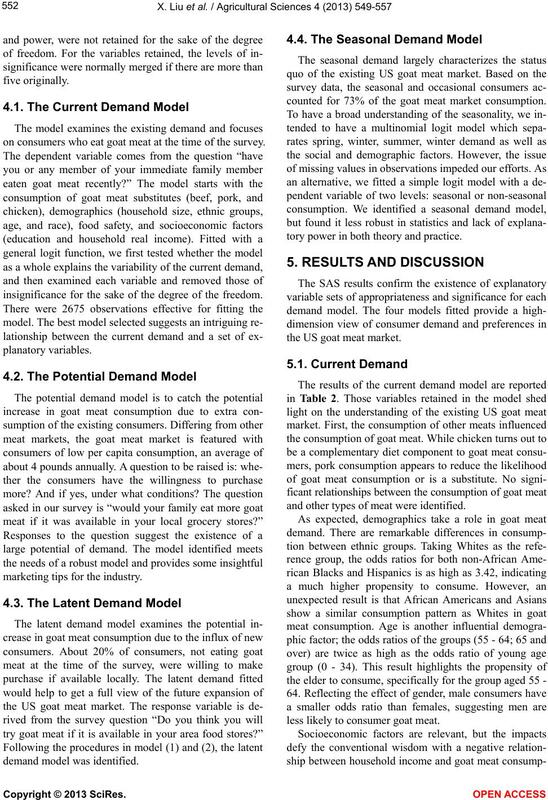 tial demand, the latent demand, and the seasonal demand. promising US goat meat market. dents, including education and household income. of the degree of the freedom. odds ratios via logit parameters. Table 1. Variable definitions and summary statistics (cont.). 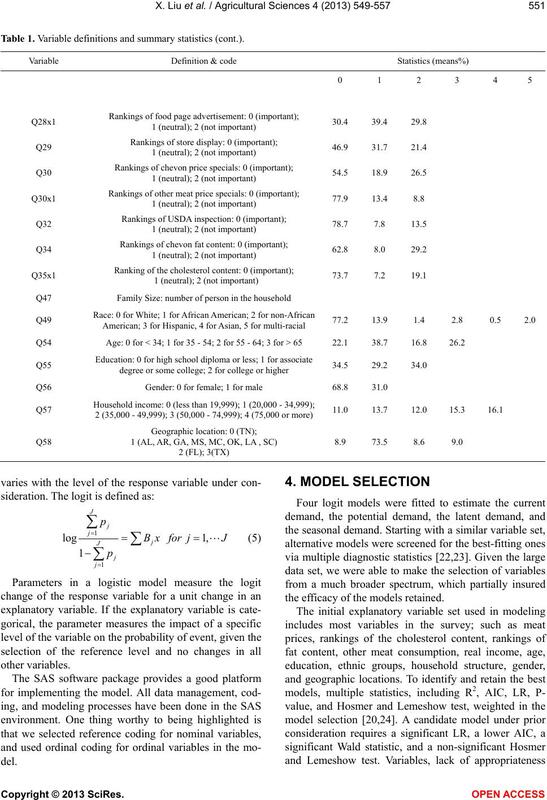 the efficacy of the models retained. on consumers who eat goat meat at the time of the survey. insignificance for the sake of the degree of the freedom. marketing tips for the industry. counted for 73% of the goat meat market consumption. tory power in both theory and practice. the US goat meat market. and other types of meat were identified. less likely to consumer goat meat. Table 2. Existing demand and variables associated. Note: ***significant at the 0.01 level; **significant at the 0.05 level; *significant at the 0.10 level. 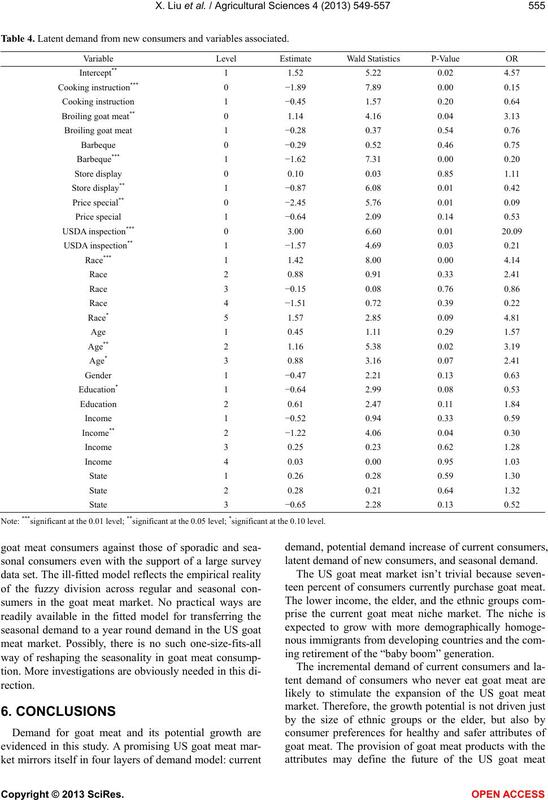 sity to consume goat meat except Texas and Florida. consumption while Florida is at the bottoms. which are largely absent in the first model. 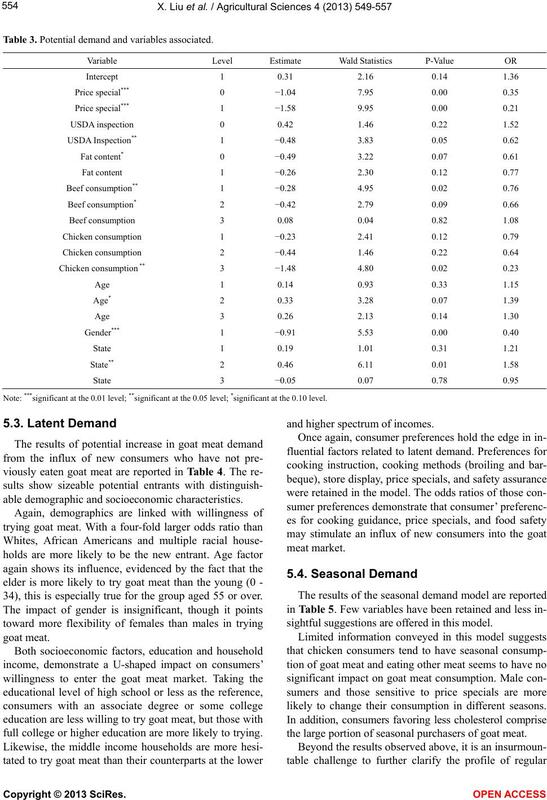 meat consumption and goat meat purchase. not taken for granted even by ethnic groups. Table 3. Potential demand and variables associated. 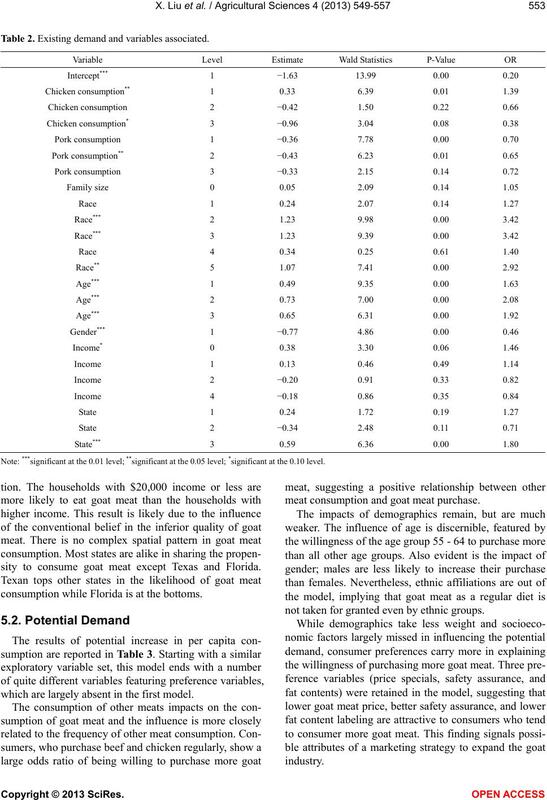 able demographic and socioeconomic characteristics. 34), this is especially true for the group aged 55 or over. full college or higher education are more likely to trying. and higher spectrum of incomes. sightful suggestions are offered in this model. likely to change their consumption in different seasons. the large portion of seasonal purchasers of goat meat. Table 4. Latent demand from new consumers and variables associated. latent demand of new consumers, and seasonal demand. teen percent of consumers currently purchase goat meat. ing retirement of the “baby boom” generation. Table 5. Seasonal demand and variables associated. in the US goat meat market for some time into the future. sumer demands create opportunities for US food system. the perception of beef. Agribusiness, 9, 57-63. Ellen, J.V.L., Caputo, V., Rodolfo, M., Jean-Francois, M.
organic chicken breast: Evidence from choice experiment. Food Quality and Preference, 22, 603-613. 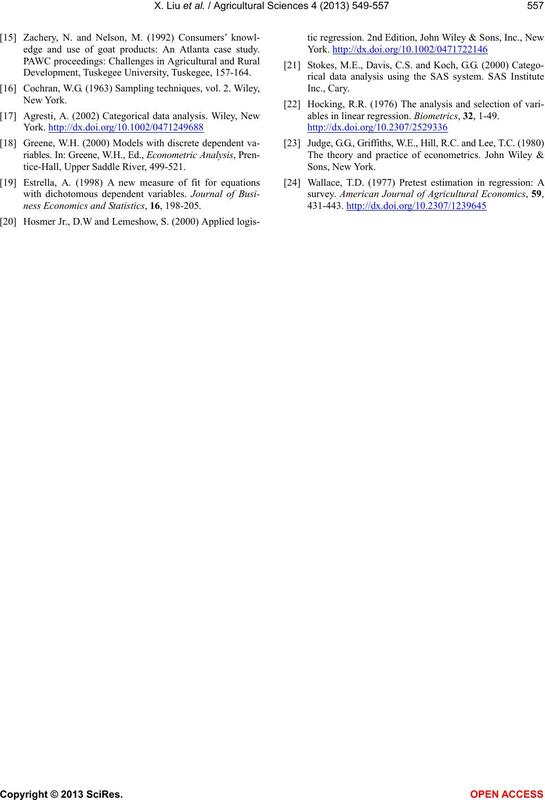 Journal of Agricultural Economics, 42, 397-412.
sumer willingness to pay for country-of-origin labeling. 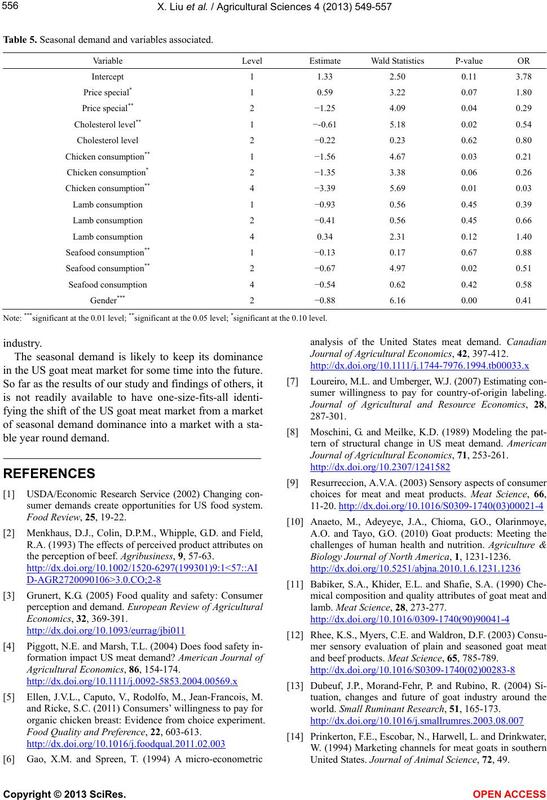 Journal of Agricultural Economics, 71, 253-261. Biology Journal of North America, 1, 1231-1236.
lamb. Meat Science, 28, 273-277.
and beef products. Meat Science, 65, 785-789.
world. Small Ruminant Research, 51, 165-173. United States. 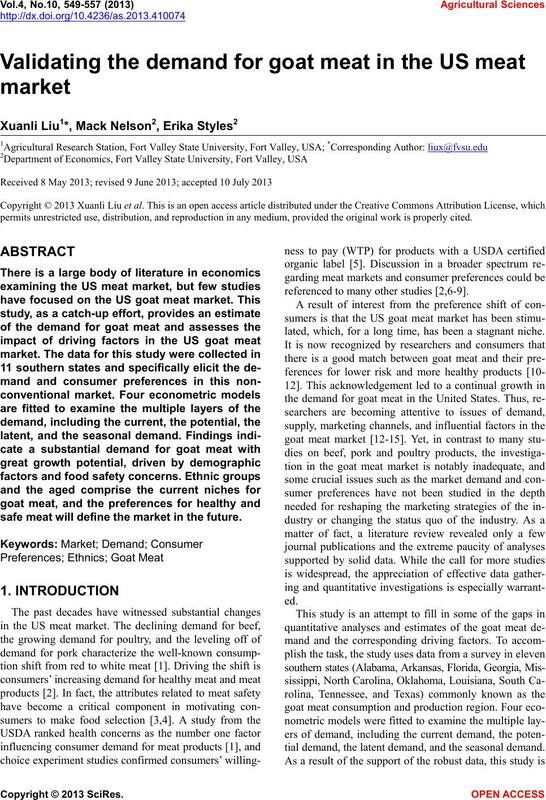 Journal of Animal Science, 72, 49.
edge and use of goat products: An Atlanta case study. 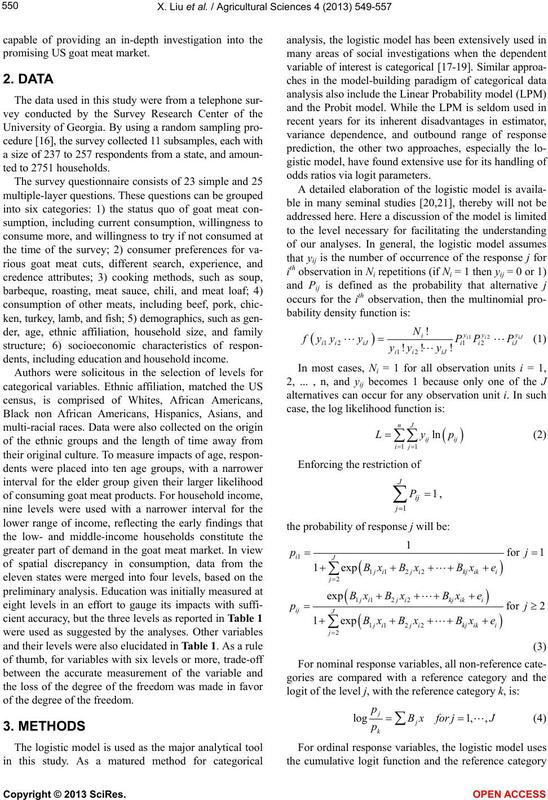 Development, Tuskegee University, Tuskegee, 157-164.
tice-Hall, Upper Saddle River, 499-521.
ness Economics and Statistics, 16, 198-205.
ables in linear regression. Biometrics, 32, 1-49.